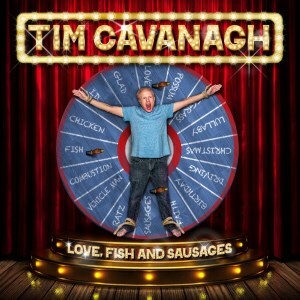 "Love, Fish and Sausages" is comprised of twenty original tracks and one parody song. "Vehicle Man," is a parody of the 1970 hit from the Ides of March, "Vehicle." "Vehicle" was written and sung by Jim Peterik and Tim is delighted to have Jim joining him on "Vehicle Man." Plus, The Ides of March Brass played on the track. The other twenty tracks explore such themes as troubles with women, food, driving, Christmas, and an oft recurring theme in Tim's writing: dead animals. Or, download the entire CD for $9.99*. 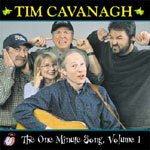 "The One Minute Song, Volume 2" contains two dozen of Tim's favorite funny songs as heard on "The Bob & Tom Show," the nationally syndicated morning radio program. While the CD is considered to be comedy first and foremost, there's an educational component to it, too. Is there an official song celebrating Cinco de Mayo? What would Jesus eat? How many restrooms are there in the Montego Bay Airport? How do you misspell Enron? These questions and more are answered on "The One Minute Song, Volume 2." NOTE: Tim had a long running segment on "The Bob & Tom Show" called "The One Minute Song" in which he tackled subjects from the Pope to high gas prices to holidays that needed songs. The One Minutes Song Volumes 1 & 2 contain many of the songs aired live on "The Bob & Tom Show." Or, download the entire CD for $12.99. "The One Minute Song, Volume 1" contains 29 tracks, featuring the most requested of Tim's One Minute Songs as heard on "The Bob & Tom Show," the nationally syndicated morning drive radio program. The first 20 songs are live cuts from Tim's appearances on the show. The remaining 9 cuts are studio recordings featuring Tim with the incomparable musicians and singers of "The Bob & Tom Band." Don't let the math fool you. Twenty-nine One Minute Songs add up to over 50 minutes of comedy. Now if you're saying, "But Tim, I'm not familiar with Bob & Tom!" No problem! It's still a very funny CD. A dozen of the funny original songs on "Sounds Like Fun!" were produced by Scott May, current member of "The Ides of March," a brilliant musician and producer for such comedians as Richard Jeni and Judy Tenuta. Two other songs were produced by the incredible duo of Steve Allee and Tom Griswold (of "The Bob and Tom Show," the immensely popular syndicated morning radio show) and feature the red-hot "Bob and Tom Band." And finally, J.B. Sky lent his considerable production magic to three other songs. Nine of the eighteen songs on the album have been featured on "The Dr. Demento Show," the legendary radio program devoted to funny music, syndicated out of Los Angeles. "I Wanna Kiss Her (But She Won't Let Me)" was featured on the anthology album, "Demento's Mementos."